Description: This concept appeared for the first time in Switzerland and quickly spread in the countries of Europe and America. Besides being a restaurant in the dark offers a unique customer experience, there are concrete advantages due to lack of sight, the food tastes and smells better. A blind restaurant is conceived so that there are no sources of light in the interior. 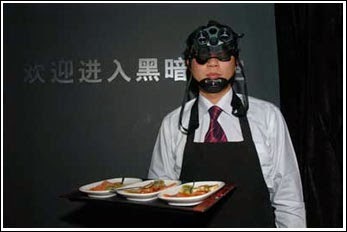 The waiters are equipped with special glasses for viewing at night, which helps lead to the table reserved for clients and to serve those without causing accidents. Although it seems weird and exclusive idea. In other countries such restaurants organizes different types of events such as poetry, stand-up, recital, etc. For many artists, hobbyists would have perhaps even an advantage that we do not see their audience. -arranging rental or renting a space so as to be deprived of natural light. Conclusions: for those who want to invest in something unique, such a restaurant may prove an interesting investment, though even for a simple restaurant is pretty big investment, the only functional advantage would be a very small electricity bill. 0 Response to "Business Ideas: Blind restaurant (Dining in the dark)"